The perfect match in function and style, this chair-and-a-half and ottoman combination is the ultimate lounge experience. 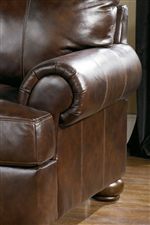 Upholstered with sleek leather upholstery over 1.8 density foam cushions, this combination piece offers head-to-toe comfort and quality support. Where style is also key, both pieces blend effortlessly together with their traditional bun wood feet and subtle stitching accents. Perfect for kicking back and putting your feet up after a long day, this chair-and-a-half and ottoman combination is just what every living room needs. 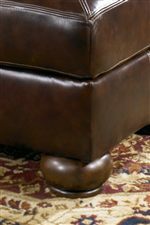 The Axiom - Walnut Traditional Upholstered Chair-and-a-Half and Ottoman with Bun Wood Feet by Signature Design by Ashley at Walker's Furniture in the Spokane, Kennewick, Tri-Cities, Wenatchee, Coeur D’Alene, Yakima, Walla Walla, Umatilla, Moses Lake area. Product availability may vary. Contact us for the most current availability on this product. 4200014 Ottoman 1 44" 24" 18"
4200023 Upholstered Chair and a Half 1 55" 40" 38"